Lot 612. Augustus. 27 B.C.-A.D. 14 AR denarius (16 mm, 3.59 g, 8 h). Lugdunum, 2 B.C.-A.D. 14. 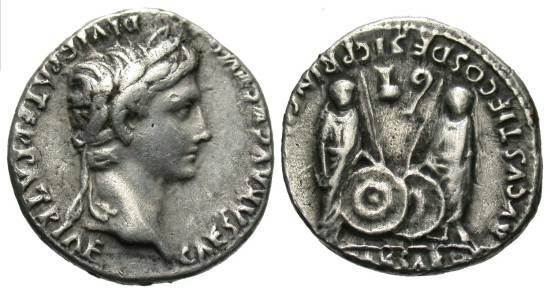 CAESAR AVGVSTVS DIVI F PATER PATRIAE, laureate head of Augustus right / C L CAESARES in exergue, AVGVSTI F COS DESIG PRINC IVVENT around, Gaius and Lucius Caesars standing facing, resting hands on shields between them, two spears behind; above, simpulum and lituus. RIC 207; BMC 519; RSC 43. Lightly toned. Very fine.